If the world treats them as though they are an authority, every idiot will be obliged say that the objective conditions of a situation are complicated to the point of being incomprehensible. In the run up to the 2015 general election, this is rapidly becoming the defining feature of both mainstream political commentary and policy formulation. The mystification of political journalism is nothing new. It carries with it a whole vocabulary designed to complicate simple ideas. Between now and May, you won’t be able to move for people talking about “the electorate” in the third person and how things might “play” with them, or people using the word “data” unnecessarily, or political correspondents “revealing” very obvious things from “insiders”. This election, however, is witnessing a new and higher stage of disorientation. Mainstream political commentary and policy manoeuvring – with all of its reduction of power and politics to the level of a game – has always failed to understand or relate to social realities, but they are now failing to understand even the game they were designed to master. It isn’t just the breakdown of first past the post or the rise of new parties that is confusing the picture – it is the collective inadequacy of the political establishment, grounded in centrist dogma. The result is a series of policies that nobody really wanted, surrounded by coverage that cannot link anything that happens in Westminster to how or why people vote. The constant repetition of polling data through every orifice of the mainstream press, usually a means of droning out political ideas with an avalanche of digits, has served only to underline this. In two consecutive weeks in February, just as it looked like the minor parties might at last recede and normality prevail, the mainstream press professed its astonishment at the apparently Kafka-esque voting intentions of the general public. First, Labour jumped ahead “despite” a week in which they were savaged by business leaders; then, a week later, the Tories gained a one point lead “despite” week in which saw the HSBC revelations and dodgy business connections. It was as if no-one could tell what was happening; the Nick Robinsons looked on, powerless and afraid, as events which ordinarily would have moved mountains in previous elections seemed to have no effect on a ceaselessly shifting tide of coloured lines on a graph. The reality of this election is extremely simple: Labour is too right wing to win an overall majority. For many months, it has become pop analysis to cite the fact that most of the public – even most Tory voters – support nationalising the railways and utilities, or that most people are to the left of Labour on taxing the rich. Now, months into the campaign, these sentiments are entrenched into the arithmetic of the election: the Green Party is taking a large proportion of the disillusioned Labour and Lib Dem vote, and the left-of-Labour nationalist surge in Scotland is robbing Miliband of what should be a walk-over parliamentary majority. The reason for all the apparent “complexity” is that mainstream political commentary and analysis cannot allow itself to acknowledge these relatively simple facts. The battle over the centre ground and over a number of shibboleths (demonization of the poor and migrants, ‘toughness’ on crime and “the deficit”) has been the staple of political journalism for decades. In the run up to many general elections, these points of reference were, sadly, true – even if they were reflections of what the media and politicians themselves put out. But if taken in isolation they are now redundant, and all that political analysts can give us is mystification and endless, endless graphs. The Labour Party should be perfectly capable of adapting to these realities. In fact, some form of this realisation was the very basis on which Ed Miliband won the Labour leadership. Unlike his brother, Ed realised that there was mileage in taking on the banks and big business, allying with anti-establishment sentiments, and in re-instituting, even in a different form, basic elements of the social democratic consensus that had informed the leadership of the Labour Party before Blair. 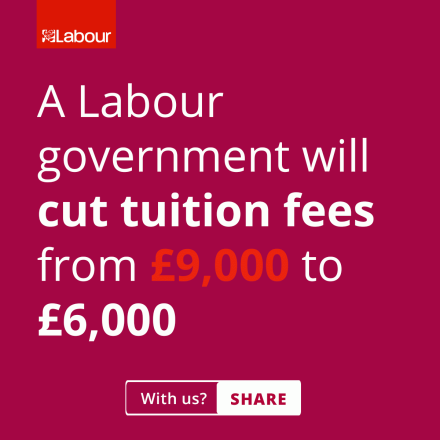 Last week’s announcement that Labour would cut tuition fees to £6,000 symbolises the failure of Miliband’s leadership – not because he has failed to succumb to appease the right wing press, but because he has seemingly failed to face down the right wing of his own party. In the past, Miliband had talked about a graduate tax, a policy which, while being a rebranding of fees rather than their abolition, would have had a tangible effect on how universities are funded. Labour’s fees policy will effectively change nothing in higher education: the marketisation of the sector will not be challenged, and neither will the privatisation of services, the casualization of staff or the consumerisation of student life. Students will still pay a sticker price for their education, they will still take on vast debts, and they will still live in poverty: Labour’s other announcement, of a £400 annual increase in student support, will barely pay for two weeks’ rent in a London hall of residence. Six thousand pound fees are a gesture in the right direction, but one which does nothing to challenge the status quo politically, and does no-one any good in material terms. They are a policy – like a price freeze on utilities, or maybe-sort-of allowing the government to bid for its own rail franchises – which would have made crude opportunistic sense in a battle over the centre ground. But in the current climate, they are no things to no people, a tacit acknowledgment that the Greens and the SNP are right, but that Labour is too spineless to implement left wing policies itself. Blairism and centrism in the Labour party fitted so well into the world of the hacks and political correspondents because both sets of people shared a self image backed up by a common historical narrative: they were the post-ideological technocrats who rejected the idea of party politics as a means of mass working class participation, and who understood the ‘game’ of politics. It is well overdue that this version of politics was exorcised, if only in the name of expediency.